In football, it’s the Super Bowl. In dog shows, it’s the Westminster Kennel Club Dog Show at Madison Square Garden. And on Tuesday night, an underdog from Virginia took top honors. The audience roared with delight when Foxcliffe Hickory Wind, a 5-year-old Scottish deerhound from Warrenton, Va., was named Best In Show. She represented the hound group and beat out the top dogs from each of the other six breed categories. It was a surprise win, as those of the betting persuasion had their money on the Pekingese or fox terrier. 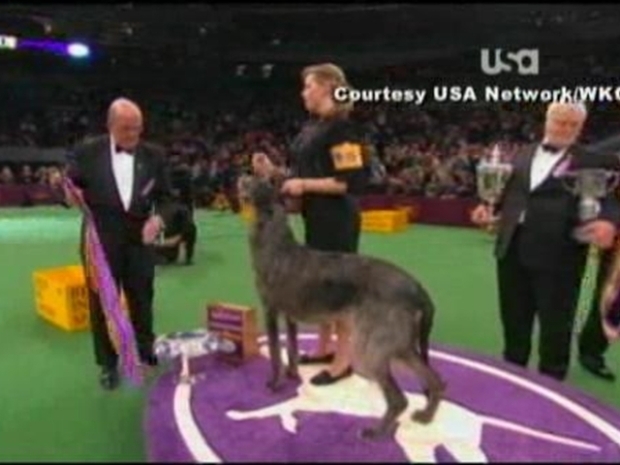 This is the first time a Scottish deerhound has ever won Best in Show at the Westminster Dog Show. Her handler, Angela Lloyd, beamed and hugged Hickory in front of the television audience. Her human owners are Sally Sweatt, Cecilia Dove and R. Scott Dove. The Best in Show hails from Virginia. Hickory, apparently, isn't one for the city life. She loves to chase deer and rabbits on a 50-acre farm in Warrenton much more than hailing a cab in New York City. "She's not used to lights, camera and noise," Lloyd said. For her efforts, Hickory will get a couple of Manhattan treats on Wednesday -- steak at famed Sardi's restaurant and a trip to the top of the Empire State Building, according to the Associated Press. More than 170 breeds and 2,500 dogs entered the competition, which ran two days. This was the 135th year for the Westminster Dog Show.